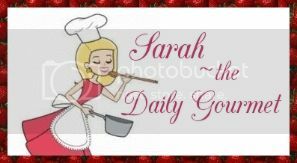 The Daily Gourmet: Baby it's cold outside! Let's have chili inside!!! Baby it's cold outside! Let's have chili inside!!! This month Knorr was the product sponsor for the Allstar. We were given a task of creating chili. We were able to select one of five different rice flavors: Spanish rice, Chicken, Chicken Broccoli, Cheddar Broccoli and Creamy Chicken. Additional guidelines: it must be ready in less than 30 minutes, use fewer than 8 ingredients, use 2 vegetables, must serve 4-6 people and be low in sodium, saturated fats, and sugar. Challenge accepted!! I decided to go with the Spanish rice. Normally when I think of Chili, I do NOT think of beans. Beans are a filler. 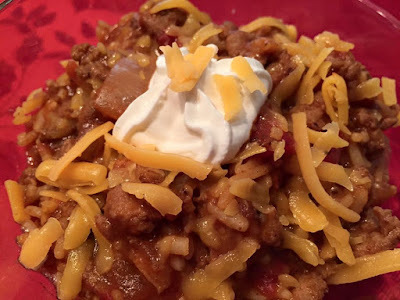 I wanted my chili to pack some flavor and I didn't want to rely on beans. So beans were out. I spotted some Italian turkey sausage and found my second ingredient.The next part was the vegetables. Simple enough, fire roasted tomatoes, and diced onion. Four ingredients down, and four left to go (if I wanted to use all 8 ingredients). I went over to my lovely spice rack and selected Chili Powder, Cumin, and Coriander. 7 ingredients...yep it's the number of completion and so I stayed within the guidelines. 1. In a large dutch oven, brown turkey over medium heat, stirring frequently and breaking up turkey. Cook until brown, about 8 minutes. 2. Raise heat to medium high and add in onions Allow to carmelize, about 4 minutes. Add in the fire roasted tomatoes. Stir to combine. Pour in the Knorr rice packet, and add in the water, cumin, coriander, and chili powder. Stir to combine. Bring to a boil, lower heat, cover and simmer until flavors blend. About 8 minutes.